FAMILY, MATURE ADULTS AND PET FRIENDLY.FUN FOR ALL! REDBUSH is a new two bedroom bungalow situated in the picturesque village of Morrisburg on a dead end lane on a tranquil treed lot. Will sleep 6: 2 double beds and a futon. Enjoy open concept living, a modern kitchen with range, fridge, diswasher and microwave. Small appliances include electric kettle, coffee maker, blender and toaster.Pots and pans, dishes and cutlery provided as are fresh bedding and towels. The dining area has a large harvest table to seat 6. Large sofa and futon in the living room with flat screen satalite t.v., d.v.d, games,books and movies. Washer and dryer in the basement. Shed for storage, b.b.q, patio set and patio chairs on front deck. Lawns back and front for fun and games. We emigraged to Canada in 1982 from Wales in the U.K. where we farmed. We settled in North Stormont with our two children who continue to farm with us as partners. We have always liked the Morrisburg area and often come to have brunch and visit the dock, sit awhile to watch the birds, ships and people's activities. When we found this property we fell for its atmosphere and knew we wanted to purchase it. In 2012 we built the bungalow and have enjoyed making it like a second home. We really love the fact that it feels like a little bit of country in a village. Modern facility with tub with shower, toilet and vanity. Tiled floor. situated on a quiet dead end lane, within walking distance to amenities. 3 minute walk to St. Lawrence River, green space, splash pad , children's play area, ice cream hut. bicycle and walking trails. We provide all the linens. Washing machine is in the basement. The dryer is in the basement. Detached garage for sports gear and toys. Also refered to as a shed. We privide towels for indoors but not for the beach. Pepper, salt, sugar,coffee, tea milk. Paper towels and aluminum foil, farm fresh eggs. Sufficient china for 6 people,glasses casseroles and serving bowls.Pots and pans. flatware,can opener,sissors,utility knives,splatula,ladle,egg cups. Microwavable dishes.Patioware included. Open concept with harvest dining table and 6 chairs. Ceiling fan and laminate floor. There is an assortment of books for children and adults. Cards and board games suitable for all ages. We have a mixture of movies to view for children and adults. Lawn back and front suitable for ball games and for children or dogs to run about. Kayaks are are available at Crysler marina just a few minutes away. They rent and give lessons. Bring your bicycles and enjoy the bike paths. Bring your boat and water toys to enjoy the St Lawrence River. Deck across the front of property. Smaller deck on the side. Bring your own equipment and choose from 4 different golf courses for your pleasure. You will be welcomed with a home made desert and complimentary free range eggs. We have also compiled a file for your use of emergency nos., restaurants, and all the local amenities and activities. We loved it as did our dogs. It's quiet position and many amenities were perfect for us. Very clean and comfortable. We had a lovely weeks stay in this modern clean and spacious cottage. Thanks for the muffins, fresh milk and eggs. We had a wonderful stay in this lovely property which is only a short walk away from the river. Highly recommended. Lovely clean & perfect size house for our needs. Thank you & I will be back. Thank you Julia! We look forward to your next visit, best regards. 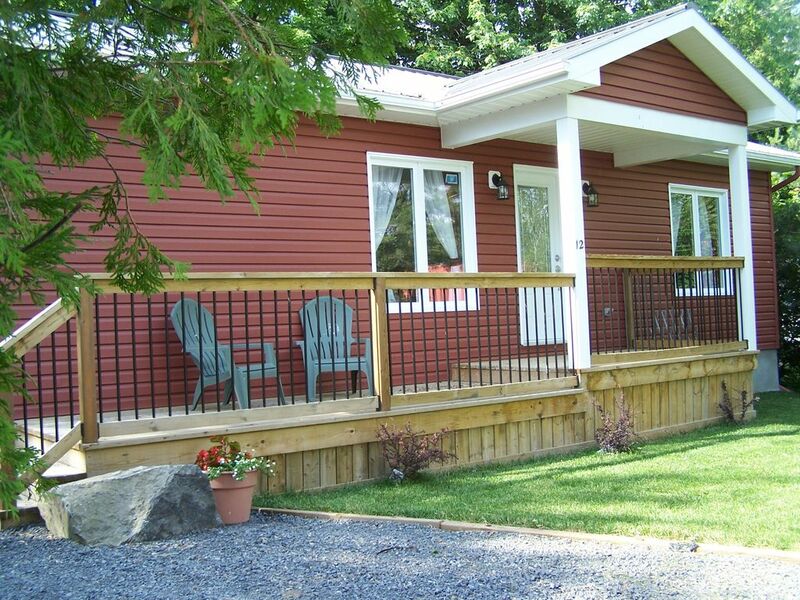 This unit is more like a small home as opposed to a cottage. Clean and completely equipped on a quiet off street location but within a short walk of the scenic path along the river. We stayed a month as it was ideally suited to our needs for visiting relatives and playing golf. You had beautiful weather for playing golf. Immaculately clean. Wonderful hospitality. Charming locale. Beautifully situated in Morrisburg, this property is more than a cottage - it is a warm, welcoming home. It is complete with all amenities, and Andrea is a warm and charming hostess. The property is immaculately maintained, and the inside is a full functioning house - not just a charming cottage. My only wish is that I could have stayed longer. Thanks Larry for such a glowing review! It was a pleasure to meet such a polite, thoughtful person who takes the time to have a holiday with his Aunt each year! It is unfortunate for you that the weather was rainy for your visit but obviously it gave you the opportunity to use your cooking skills and make good use of the kitchen. We pride ourselves on doing a good job and strive to have everything immaculate for our guests. There is plenty to do and see in the area whatever the weather and if you decide to stay at home it is private and peaceful. The front deck is a great place to sit and chat, drink coffee or read a book. Hopefully we will see you again!! Redbush was great. location to the park also.the cottage was fully stocked ,even with a few surprises. Very clean. Exceeded our expectations. Had a wonderful ,relaxing time. Would go back .again. thanks for allowing my husbands mom to visit. She enjoyed her stay very much. Thank you for choosing Redbush and for taking the time to write a review. So pleased to meet the lovely Chance and glad he was happy swimming in the river St. Lawrence. Enjoy the remainder of the summer!! Redbush is situated in the picturesque village of Morrisburg in scenic South Dundas County.We are just a three minute walk to the dock on the beautiful St. Lawrence where you can launch your boat, fish, dive, watch the ships from a bench or walk your dog in the park. Colourful walking trails, children's playground with splashpad and a public beach,biking trails are close as are Upper Canada Playhouse, an excellent live theatre-a must visit. Come out to Pumkinferno at Upper Canada Village Oct. - Nov. and again for Alight at Night Dec.30-Jan5., Upper Canada Bird Sanctuary,hockey arena,St Lawrence Acustic Stage and antique shops and a large weekly flea market . Several restaraurants in the village. After your day out come back and cosy up on the sofas with a compimentary hot chocolate with marshmallows and slippers and wrap up in a blanket in front of a glowing electric fire. Chat about your day, play a board game or watch a movie. Morrisburg is a rural area with farmers markets and pick your own fruit and vegetables in season so come and taste its bounty. The MACINTOSH apple was discovered locally! Come pick your own apples at one of the local orchards. Lots of fun for all! There is something to interest all - young and the not so young.